What would you do if you knew someone near you is about to die? Kaylee Cavanaugh SCREAMED BLOODY MURDER. That's all she could do, besides panicking like crazy of course. And her family (Uncle, Aunt) thought she was crazy and sent her to the hospital after one of her first screaming fits and she's been hiding it from them ever since. Until she saw somebody who's about to die in the pub while having a great time with Nash. She panicked upon seeing her and had to struggle to keep the scream within her. Luckily, Nash brought her outside to cool down. She totally freaked out when she saw the news of the girl's death on TV the next morning. Of course she called Nash, wanting somebody to assure her that her eyes wasn't playing with her and that she was really telling the truth about being able to "predict" somebody's death. She didn't want another hospital episode by telling her family about this. Nash seemed to have a good idea of what was wrong with her. He didn't think that she was going crazy and hung out with her a lot. Her uncle was hiding something about her. She overheard them saying something about her living on borrowed time and thought she was going to die of some illness too. That's when Nash spilled the beans. She's... something different... and so was him... But there's more than meets the eye when there's more sudden deaths occurring among her schoolmates. Something's wrong. Dangerously wrong. It's up to them to stop the culprit. Will they succeed? What's Nash role? What's the secret that her family was hiding from her? There's so many questions! 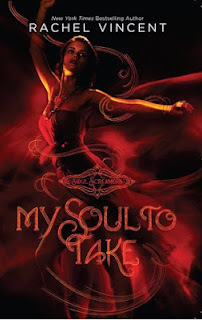 My Soul to Take is a fast refreshing read. I'm totally captivated by Rachel Vincent's words and Kaylee's thoughts. Kaylee was a strong girl who felt guilty towards those girls who died and whom she had predicted would die. She thought she could at least warn them about their deaths but the moment she opened her mouth in the midst of her panic, she'd scream and bring unwanted attention to herself. Nash was cool and he seemed to take interest in Kaylee for who she was and has been sticking to her ever since that fateful day in at pub. Well, at least he did help to sort out her "mental state". He has a history too! About a guy working in the hospital who has private information about the "death victims". I really wish I could read more about this person. Probably in the next book? (Cross my fingers) I like the way the two guys taunt and bicker with each other. 4/5 Stars for My Soul to Take.